ROME (CNS) — Fra’ Giacomo Dalla Torre was elected the 80th grand master of the Knights of Malta May 2 and promised to continue the reform of the order begun last year when he was elected its interim head. 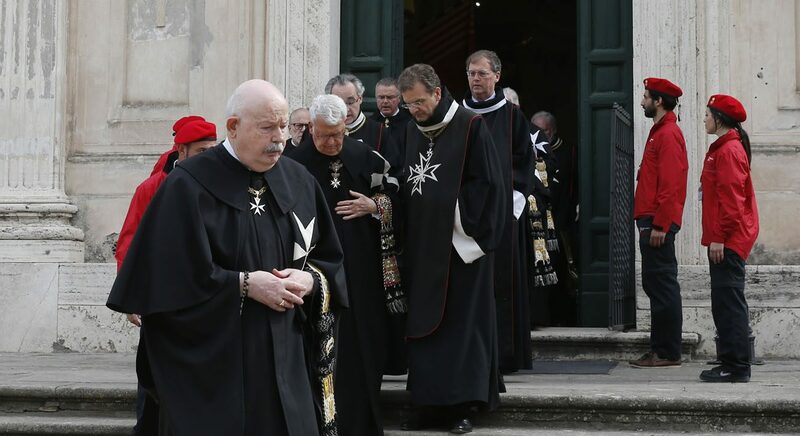 In a solemn procession after morning Mass, 73-year-old Dalla Torre and 53 other leaders of the Knights of Malta — including, for the first time, two women — walked into the order’s villa on Rome’s Aventine Hill to begin voting for a new leader. The electors, who form the Council Complete of State, completed the voting in one morning. They chose their new grand master from among 12 eligible knights, who have taken solemn vows of poverty, chastity and obedience. They also had the option of deciding again to elect a lieutenant to oversee the order for one year. Dalla Torre had served for the past year as lieutenant with the task of leading the revision of the order’s constitutions after months of turmoil and crisis. In early 2017, Fra’ Matthew Festing resigned as the order’s grand master at the behest of Pope Francis, who had established a commission to investigate his removal of the order’s grand chancellor, Albrecht Freiherr von Boeselager. Festing refused to cooperate with the investigation and insisted the firing of von Boeselager was a sovereign act outside the Vatican’s jurisdiction, although the knights take a vow of obedience to the pope. Although von Boeselager was reinstated as grand chancellor, his firing and the pope’s intervention drew public attention to disputes within the order, which is known mainly for its massive programs around the world to provide medical care to the poor and humanitarian relief following disasters and to assist migrants and refugees. To be eligible for election as grand master, the candidate also must have demonstrated that he came from a noble family. According to information released by the Knights of Malta on the eve of the election, there were 12 eligible candidates. Dalla Torre was born in Rome Dec. 9, 1944, and studied Christian archaeology and art history at the University of Rome. He taught classical Greek at Rome’s Pontifical Urbanian University and served as the university’s chief librarian and archivist. He has been a member of the Knights of Malta since 1985 and made his solemn profession of vows in 1993.